Indian Restaurant in Courtenay and Nanaimo. Genuine Indian and Asian food. Eat in, take out, get delivery. 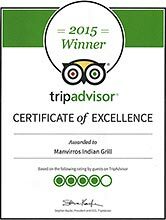 | Enjoy authentic Indian Cuisine in the Comox Valley and Nanaimo. Come and bring your appetite! Sit and enjoy genuine Indian cuisine! We offer a comprehensive selection of beer, wine and spirits. offered in Courtenay AND Nanaimo. Daily from 12:00 - 2:30 pm. A British favourites, also known as “Balti Lamb”, cooked with tomatoes, ginger and yogurt. Prawns, Onions and cream blended perfectly to create a harmonious taste. The dish of the mogul Emperors. A thin crispy Indian lentil chip. Chickpeas cooked in tomatoes, onions, ginger, garlic and tossed with coriander leaves. Hot Beef curry with potatoes & coconuts in a tangy curry sauce. This will definitely jump start your taste buds. Inside the menu card, navigate between items using the "Previous" and "Next" buttons on the sides.